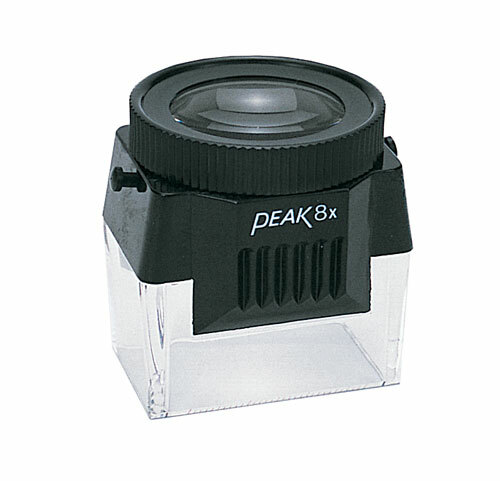 Peak Magnifier 8X is a high performance, smartly designed magnifier. It is very convenient to have around your desk for daily use. This magnifier is specially designed to cover the entire 24mm x 36mm picture area of single frames of film for 35mm camera use and is most ideal for checking negatives. 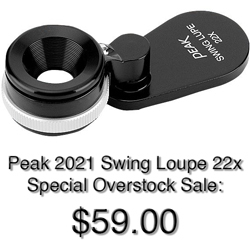 This is a high grade magnifier in which a 24mm x 37mm angular object lens is employed in the optical system to cover single 35mm frames, and a two-element achromatic lens is used in the eyepiece. On the bottom edge of the skirt of the transparent acrylic is engraved a 30mm long 1mm pitch scale. The Light Box (2046) is a new item with an auxiliary lighting source to be used where the supply of light is not sufficient when you use the Loupe 8X with Puncher & Holder or Microfilm Viewers 15X and 20X, and Hand Viewer 8X (item 2026). (Two kinds of white diffusing plastics are used for the light box).